It was a West Coast showdown in suburbia Toronto this past weekend as two B.C. bowlers battled for their chance to represent Canada in Australia. Westlake delivers while Sidel watches. Shortly after the Junior Nationals, 25 & Under World Cup qualifier and Forster Lang Pairs were completed, the National 25 & Under Championships took place. Along with being titled the best in the Country for the year, this year’s champions would also earn a trip to the 2015 World Championships in Queensland, Australia. B.C. 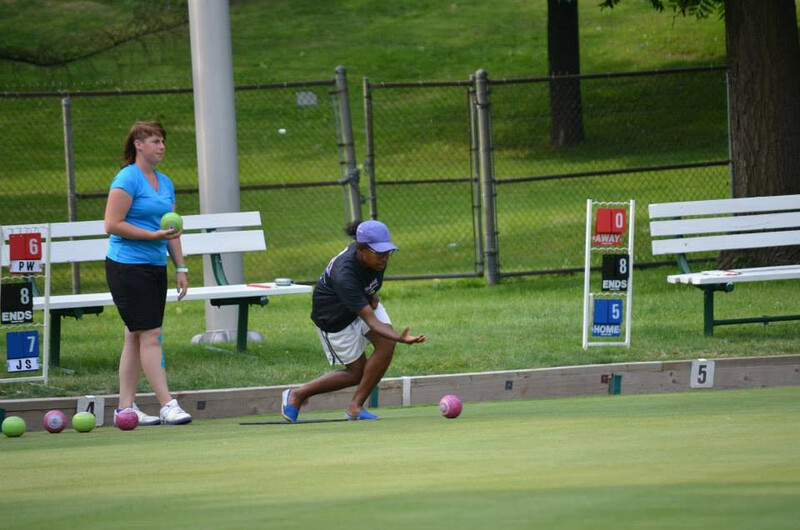 had two girls travel to the Etobicoke Lawn Bowling Club and both ended up in the final. Also, in the true spirit of a final game, the girls went the distance and settled the match in a three-end tie-breaker. But it was Pricilla Westlake who pushed through in the final ends to win (11-7, 6-8, 4-2) over Jaymee Sidel, silver medalist in the U25 World Cup qualifier. Westlake has now earned two 2014 national gold medals. The bronze medal went to Stirling Wood of Ontario.